Last week I saw this jersey in a local craigslist ad. Immediately it was obvious that the “BL IRONMEN” text was affixed to the back sloppy. Still wasn’t too much so I purchased this and a PBJUNKIES jersey. 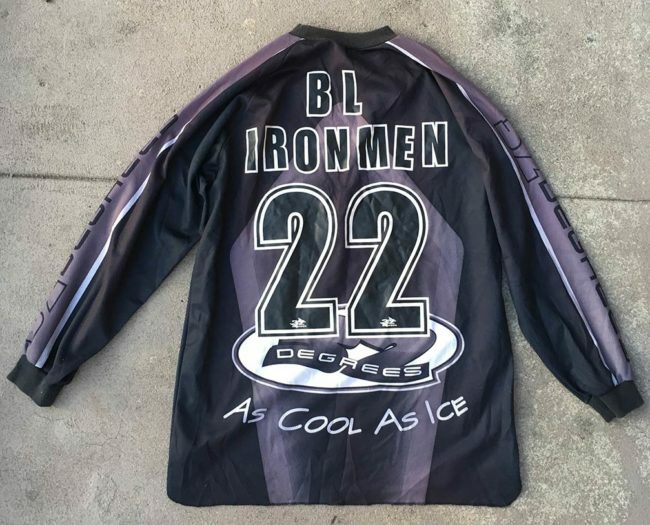 Bob Long Ironmen 32 Degrees “As Cool As Ice” Jersey from local seller. Unclear if legitimate. The seller, Gary, remembers being given this jersey over a decade ago at SC Village. During the time he was paintballing with a celebrity paintball team whose members included Will Smith. Gary shot a Spyder and Tippmann but “never upgraded to an Angel or Autococker.” Unfortunately, Gary did not remember the name of his team. I had wondered if the numbering would be poorly affixed, indicating this could be an iron on kit from 32 Degrees that someone styled after the Ironmen. Apart from the slightly crooked lettering I did not see other signs the “BL IRONMEN” lettering was home done. Front side of 32 Degrees jersey with “BL Ironmen” on back. 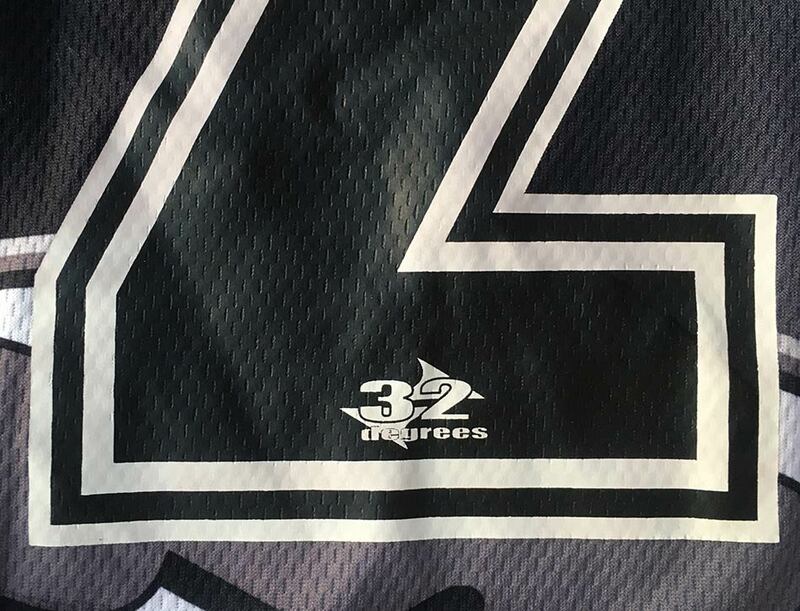 Back side detail on numbering shows 32 Degrees logo on base. 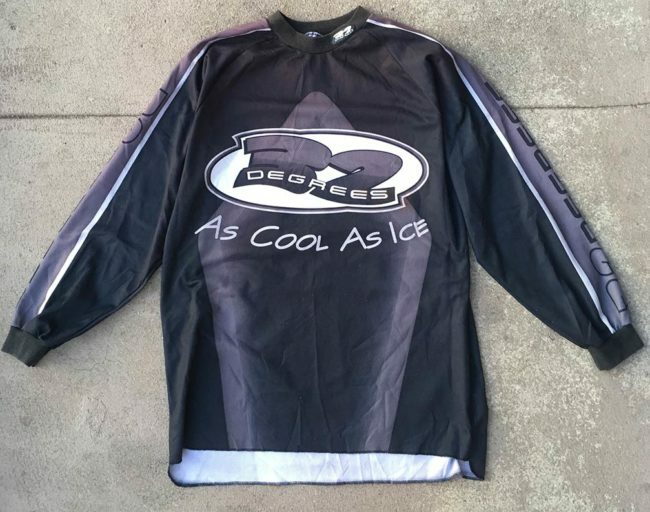 After looking up 888 Paintball catalogs online I came across scans from the 2001 catalog which featured this jersey as the lowest end 32 Degrees option. I then looked at Warpig photo galleries for the Ironmen wearing this style jersey, and although they did wear 32 Degrees around that time I did not see them wearing this style. If this was a Bob Long Ironmen Jersey it was likely a practice or loaner jersey given to guesting players to wear. One neat detail on this jersey is that the bottoms of the “2s” have small 32 Degrees logos on them. This Viewloader jersey with white and grey flame pattern likely dates to around the time Viewloader was purchased by Brass Eagle in the late 1990s.